In the first story of this absorbing collection, Margarita—sixteen and married to a soldier who has gone off to fight in the first great war—meets and falls in love with Federico García Lorca. He calls her “Margarita Petita,” and then turns her name into a poem. When he refuses to marry the widowed gypsy girl after a tryst at the river leaves her pregnant, her mother curses both Lorca and his offspring: “May they all die before they see the light of day.” And so Lorca is killed by fascists and his child dies in Margarita’s womb, where it remains—petrified—for 80 years. Mysteries and furtive desires pervade the enthralling stories in this group of ten the author calls a “deconstructed novel.” Rich in imagery and language, they chronicle the gypsy’s life, including banishment from Andalusia by her mother, marriage to a famous Mexican bull fighter and the lives of numerous descendants who ultimately leave Mexico for El Paso, Texas. In one of the final stories, “Calaveras in the Closet,” the gypsy’s extensive family comes together for her funeral, where several long-guarded secrets will suddenly come to light. Also included in this volume is a historical novella, Liberata Wilgefortis: The True and Tragic Story of the Bearded Female Saint, a mystical retelling of an ancient legend about the first bearded female saint of the Catholic Church whose cult was removed by Vatican II in 1969. Expertly weaving poetry, historical events, myth and legend into intriguing short fiction, Alicia Gaspar de Alba confirms her place as one of the leading contemporary Latinx voices. 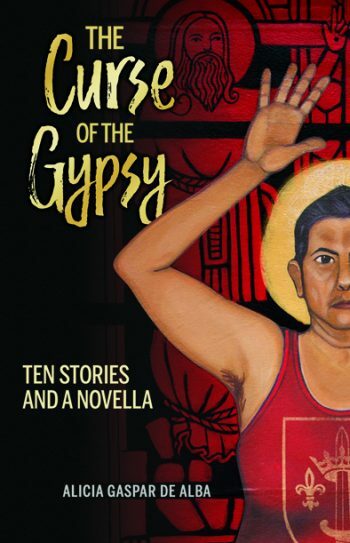 Click here to listen to an interview with Alicia Gaspar De Alba about her book, The Curse of the Gypsy: Ten Stories and a Novella. ALICIA GASPAR DE ALBA is the author of various works of poetry, fiction and nonfiction, among them a Lambda Award-winning novel, Desert Blood: The Juárez Murders (Arte Público Press, 2005) and Sor Juana’s Second Dream (University of New Mexico Press, 1999). A full professor of Chicana/o Studies, English and Gender Studies at UCLA, Gaspar de Alba is a native of the El Paso/Juárez border.